Our Italian Exchange students arrived in Varese, Italy safely and ready to experience the country. After landing in Milano, they took a 50-minute bus ride to Varese where are students met their host families who hosted a welcome reception for our Tigers. Our students went to their host family homes where they were fed again and met family and friends. 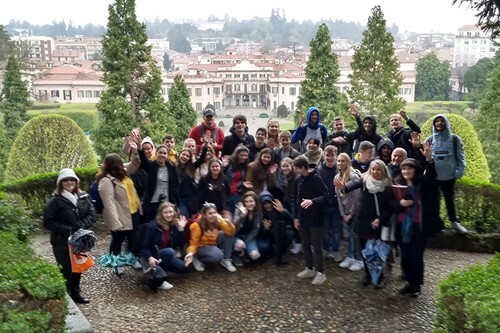 The next day students spent time at the school in Varese, attending classes and touring the campus. They then visited the mayor’s office where they toured the palace and gardens. The families hosted an incredible welcome dinner with an array of authentic foods and desserts. In the coming days, students will go to Venice, attend a professional basketball game, and continue to practice their Italian.